An elegant and environmentally friendly teapot. Made entirely of tempered glass, including the filter for a tea. In this way the herbs do not get in contact with metal, which is the best recommended method for preparation of tea. 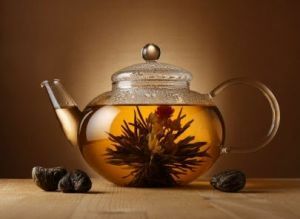 To prepare tea in the pitcher add one litter of boiling water. After 5 to 10 minutes remove the filter together with the used herbs or tea and you can place the jug on the table for guests in combination with glasses Mikado. With this jug the drinking of tea is a pleasure for the palate as well as for the eyes. High quality genuine Jena glass, withstanding the temperature of boiling.